We have another challenge at Colour crazy and the theme is ALWAYS ANYTHING GOES..
Just remember we are a color challenge..
No pre-colored images are allowed. 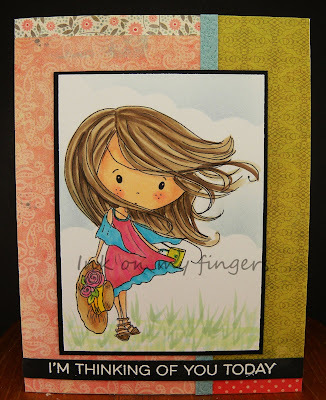 This is my card using the image called Windy day Winnie.. I started by creating my background using scraps of My minds eye that I had. I then colored the image with copics. I used my cloud template and added some wink of Stella to the shawl and flowers. I then heat embossed the My favorite things sentiment. Such a pretty color combo and a great way to use up scraps. The black mat really makes the image pop. Lovely card. Thanks for joining us at penny's paper crafty challenge this week. What a fabulous creation! Thanks for sharing it with us at Digi Choosday good luck and hope to see you again!